> New Team Registration Waivers - limited # available! Registration for the 2018-19 season is scheduled to begin August 1 ... however, look for upcoming changes to the registration process! Info to be posted by September 4. For new schools, please check with State Director regarding possibility for a registration waiver - see more info below. * See "What's New" below for important information for coaches. The 2018 Annual Meeting took place on July 21 at the Pacific Northwest University of Health Sciences in Yakima. See Board Info for details and Board of Directors and Student Advisor Nominees. See BoD Meeting Minutes for info from past meetings. Since 2010, the Society of Professional Engineering Employees in Aerospace (SPEEA) has awarded $10,300 in grant funds to Washington Science Olympiad to fund new teams. New schools interested in applying for one of the 2018-19 SPEEA registration waivers should contact Sue Murphy. Thank you, SPEEA. Adalis Corporation awarded a $5,000 grant to Washington Science Olympiad to support efforts for involving more schools and students in Science Olympiad. Headquartered in Vancouver, Adalis is a technical and industry leader in packaging, supply chain, and plywood composing fields. Thank you, Adalis. 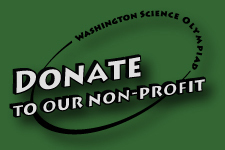 Washington Science Olympiad is part of the Washington Combined Fund Drive. This campaign is directed toward most State of Washington/public service employees. Contributions received through this campaign will go toward recruiting and scholarships. Be on the lookout for campaign information and consider including WSO in your contribution. State and higher education employees may contribute via the Washington Combined Fund Drive - charity #1479519. Electronic Rules Manuals - National Science Olympiad will provide pdf rules manuals - available 9/4/128 on the soinc.org web site. Coaches still register with WSO and will receive a link to the national site that provides unlimited downloads. Print manuals may be purchased from the national SO store. To help students navigate across campuses at WSO tournaments more easily, the board approved a new time schedule that provides 15 minutes between scheduled events. See draft schedule on web site (available by August 15). This change extends tournament ending time to 3:15 p.m. Note that tournament directors have discretion in making time changes to better accommodate their site. Your tournament director will provide schedule ASAP. Nominations for 2019-22 WSO Board of Director positions are being accepted until April 30, 2019. See nomination info/forms to apply. Memorial Fund. Washington Science Olympiad lost two extraordinary champions for Science Olympiad - Gordon Patterson and Glenn Voshell. 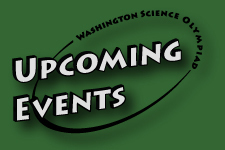 To honor their memories, Washington Science Olympiad is accepting contributions to be used for scholarships and to assist in recruiting efforts for new teams. For more information, please contact State Director. 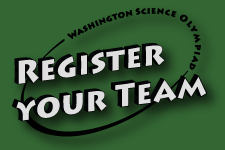 For information about participating in Washington Science Olympiad, click here. Newsletters ~ WSO publishes WSO News, a periodic newsletter for informing participating coaches and prospective teams about the latest news, upcoming events, and articles/information of interest. Registered teams will be contacted by the tournament director/s with specific information about the competition. If you have questions, contact the appropriate tournament director.